Tunstead postmill stood in Mill Road some way to the north of the village on Tunstead Common. 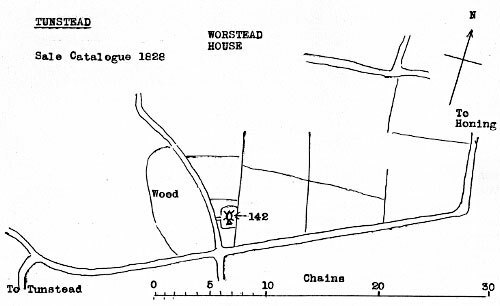 Also a MESSUAGE & POST CORN WIND-MILL, with Barn, Outbuildings and sundry Inclosures of Land in Tunstead containing 19a. 2r. 26p. in the occupation of William Lawrence as tenant from year to year, a Cottage and Two Pieces of Land containing two roods, in the occupation of Robert Mendall, at several rents amounting to £59. 10s. per annum. No. on Plan 142 Mill & Yard, 0a. 1r. 9p. 2. Sir Thomas Sherlock Gooch of Benacre Hall (suff.) Bt., Charles Drummond of Chareing Cross (Midd.) Esq. and others Messuage or double cottage in Tunstead, land on which a windmill once stood in the same.